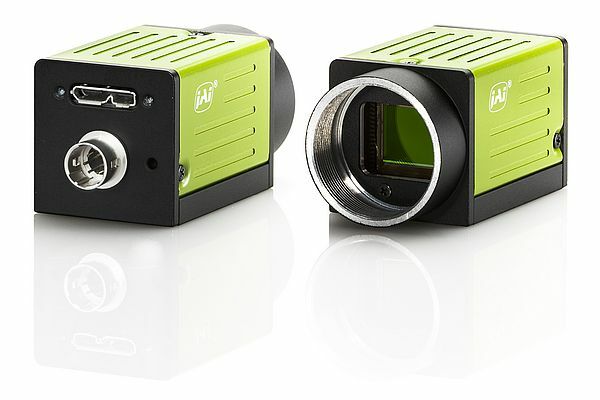 JAI launches its small and versatile 5-megapixel entry-level industrial camera GO-5000 with USB3 Vision or GigE Vision interfaces. The new models enable users to leverage two of the industry's most popular "grabber-less" technologies for direct connection to PCs or other image processing hardware. For USB3 Vision users, the GO-5000M-USB (monochrome) and GO-5000C-USB (color) use a high-speed USB 3.0 interface to provide 5-megapixel images at up to 62 frames per second for 8-bit monochrome or raw Bayer configurations. The GigE Vision models - GO-5000M-PGE and GO-5000C-PGE - feature a single RJ45 port with Power-over-GigE-Vision support to deliver image information at up to 22 frames per second. All four of the new cameras feature the same 5-megapixel CMOS imager found in JAI's high performance Spark SP-5000 camera, but with a much smaller and lighter form factor. Dimensions are 29 mm x 29 mm x 41.5 mm (excluding the C-mount lens mount) with a total weight of only 46 grams. In addition to 8-bit output at 62 or 22 fps, respectively, the cameras provide 10-bit output at up to 49 fps (USB3) or 15 fps (GigE), and 12-bit output at up to 41 fps (USB3) or 15 fps (GigE). The new models feature a combination of 5 micron square pixels and versatile ROI capabilities, enabling them to be easily configured to meet a wide range of customer requirements for resolution, speed, and optical formats.